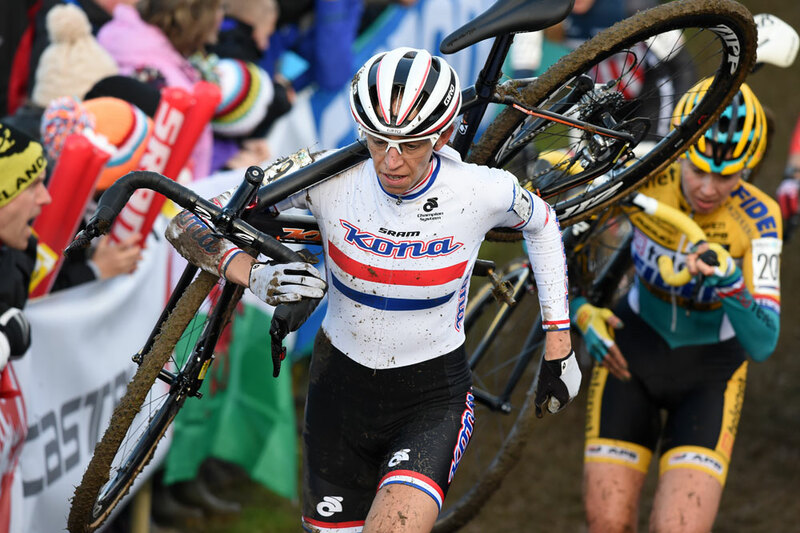 Tabor in the Czech Republic hosts the 2015 UCI Cyclo-Cross World Championships this weekend: Saturday January 31 to Sunday February 1. The coveted rainbow jerseys will be up for grabs for the fastest finisher in the elite men’s, elite women’s, junior men and under-23 men categories. Great Britain will pin its hopes on Helen Wyman, Nikki Harris and Ian Field in the senior categories. Wyman finished the UCI 2014-15 Cyclo-Cross World Cup in seventh spot behind winner Sanne Cant (Belgium) and will be looking to improve on her bronze medal last year. Harris was not far behind, ending the World Cup in ninth spot including a podium appearance in the series’ round in Milton Keynes. In previous years we would have questioned any rider’s ability to beat seven-time world champion Marianne Vos (Netherlands), but this winter she has not looked to be in top form with a lingering hamstring injury. Can Cant do the double and add a world title to her World Cup victory, or could current road race world champion Pauline Ferrand-Prévot (France) add another rainbow jersey? There will be a change at the top in the elite men’s race, with 2014 champion Zdeněk Štybar (Czech Republic) electing not to take part in the Worlds on home soil as he alters his focus to road racing with Etixx-QuickStep. Kevin Pauwels (Belgium), Klaas Vantornout (Belgium), Lars van der Haar (Netherlands) and Mathieu van der Poel (Netherlands) rank among the pre-race favourites. Britain’s Field is aiming for a top 20 place. Aside from each other, the riders’ greatest adversary is likely to be the weather, with recent snowfall turning the Tabor course a shade of muddy white. The UCI’s YouTube channel will be hosting live coverage of all four events, but this is georestricted and not available in all countries (including the UK). However, highlights will be available later. British Eurosport will be showing highlights and delayed coverage of the competitions at various times over the weekend.